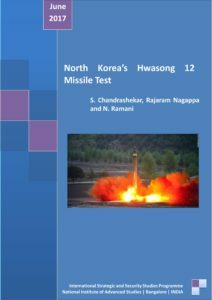 The available evidence from North Korea’s May 14 2017 launch of the Hwasong 12 missile suggests that it is a two stage missile. Measurements on the images of the missile are also consistent with an Unha 3 space launcher origin for the Hwasong 12. If this were so it would have a diameter of 2.4 m and use Kerosene and AK 27 as fuel and oxidizer. A single stage Unha 3 derived Hwasong 12 can also be ruled out based on a performance appraisal of North Korea’s current missile and space capabilities. The two stages appear to have about the same length. The first stage would be very similar to the Unha 3 booster with a propellant fraction of 84%. The second stage would also use the same engine as the Unha 3 booster but would be a more optimized stage with a propellant fraction of around 87%. These stages are consistent with what North Korea has already demonstrated through its space and missile launchings. Though North Korea has so far not tested a thermonuclear device, the length of the Reentry Vehicle (RV) of 5.25 m suggests that it is intended to carry a thermonuclear warhead. The predicted range of the Hwasong 12 missile with a warhead weighing 650 Kg launched due east with an azimuth of 90 degrees will be 4385 Km. This should allow North Korea to comfortably target Guam even with a heavier warhead. With a suitable third stage the Hwasong 12 can be converted into an ICBM that can reach the US mainland. One can expect the test of such a configuration in the near future. Taken together the successful launch of the Hwasong 12 along with the nuclear weapons testing that North Korea is carrying out indicates that North Korea is well on its way towards developing a nuclear tipped ICBM that can reach the continental United States.